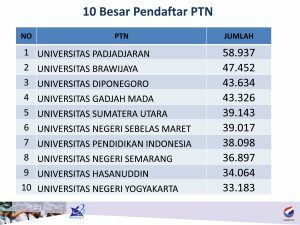 [Unpad.ac.id, 11/05/2016] Announcement of National Selection of State University Entrance (SNMPTN) Year 2016 is already available to be accessed on 9 Mei 2016. This year, Universitas Padjadjaran admitted 3,064 students from SNMPTN with total applicants of 58,937 students. 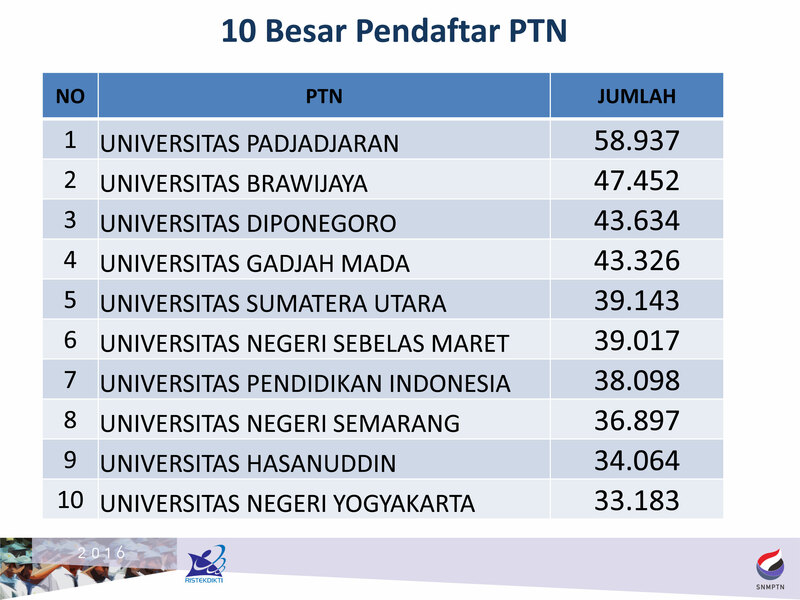 This amount made Unpad as State University with the highest number of applicants in Indonesia. The applicants who passed SNMPTN in Unpad is obligated to fill online bio in http://pengumuman.unpad.ac.id on 12-16 Mei 2016 until 16.00 WIB. Vice Rector of Academic and Student Affairs Unpad Dr. Arry Bainus, M.A., Tuesday (10/05), said that from the number of applicants, Unpad admitted 3,064 students through SNMPTN. 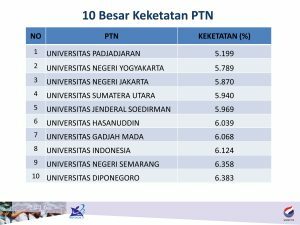 Around 5.19% applicants were admitted in Unpad. This number was comprised by 1,646 students for Science and Technology field and 1,418 students for Social Humanities. 5 Study Program based on Science and Technology and Social Humanities field have the highest amount of applicants. For Science Technology field: Medicine (5,932 applicants), Pharmacy (3,439), Nursing (3,045), Psychology (2,807), and Informatics Engineering (2,052). Meanwhile for Social Humanities field: Management (3,346), Communication Science (3,157), Accounting (2,431), Law (2,379), and Television and Film (1,711). Five Program Studies with the highest ratio for entry were: Television and Film (1:63,37), Management (1:55,77), Informatics Engineering (1:54), Communication Science (1:52,62), and Medicine (1:47,46). Meanwhile the amount of applicants who received Bidikmisi scholarship was 422 students or 13.77% from the total applicants admitted through SNMPTN. Even with the highest number of applicants, the number was less than the previous year. Dr. Arry said that the decrease was caused by school accreditation factor that was applied in SNMPTN 2016 registration. “In the previous year, all schools could apply. This year it was not the same,” said Dr. Arry. This factor also caused a decrease in national SNMPTN application number. As reported before, SNMPTN organizer applied limit in number of applicants from each school based on the school’s accreditation. The purpose was to obtain a better quality applicants. School with A accreditation has the limit of 75% applicants. School with B accreditation has 50%; school with C accreditation has 20%, and other accrediatation only has 10%. The applicants were students in the best ranking in school during the third, fourth, and fifth semester. For the applicants who passed SNMPTN, Dr. Arry urged the students to remain consistent. “You should be proud to be admitted through SNMPTN since the competition was so great. It would be a waste to take your success for granted and applied again through SBMPTN just because you were not choosing the desired program,” he said.